Calling all home decor artisans and custom home furniture makers. Visit HouseSight.com and begin promoting your services and products for free. Registration is fast and easy, and again there is ZERO cost for this service. 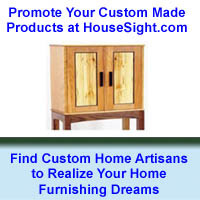 Homeowners and consumers - Check out www.HouseSight.com to find the artisan or furniture maker who can realize your home furnishing dreams. HouseSight.com is a free online marketplace service for connecting consumers and custom home themed artisans. As a consumer, at HomeAdditionPlus.com’s “HouseSight” you can view all types of home furnishing and home décor products handcrafted by custom home furnishing artisans. As an artisan, or a consumer/homeowner, you can post as many of your own custom designed and crafted projects as you like. Best of all there’s no cost to using HouseSight. To post home related projects on HouseSight, simply register, enter your profile information, and begin posting projects. With each project posting you can upload an unlimited number of pictures, write a description, and even imbed a video of the project. That’s it! No hassles or costs whatsoever. As a HouseSight member you can take advantage of messaging members who’ve posted projects. In addition, you can rank projects and go directly to the artisan’s web page if they so choose to post a link to it on HouseSight. In addition, you can leave reviews on items purchased from an artisan whose posted projects on HouseSight. So whether you’re a homeowner or renter check out HouseSight today to find the right custom artisan that can realize your home furnishing dreams. And if you’re an artisan, be it a furniture maker or home décor accessory craftsperson, begin posting your projects and promoting your business for free at HouseSight. Last week we closed on our new lake house on Lake Winnipesaukee and moved in. We love the new home and property as it is very spacious and bright. In particular we love the new property and waterfront. The property has 124 feet of water frontage and goes back approximately 335 feet. The waterfront views are spectacular. The home was built in 1999 so it is still quite modern. Since moving in I’ve already stained the deck and the back of the home to address some rust stains caused by a rusted out chimney cap. In addition, I had to fix a small plumbing leak associated with the master bathroom Jacuzzi tub. Other than those couple of issues, and needing a little TLC cleaning, the house is in impeccable order. Stay tuned for more information and home improvement projects associated with this home.